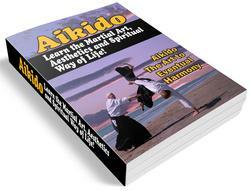 Because attention follows or is determined by the eyes, Aikido considers eye direction to be extremely important. Eyes looking one direction and body moving in another usually indicates a split between mind and body, shattered attention, and decreased concentration and strength. Listening to a speaker while looking elsewhere. Uke test. Repeating any physical exercise (such as "Arm Swinging*" on page 74 or "Spinning*" on page 75). Direct eyes and attention in odd directions away from the path of the body. Uke test and compare with properly directed eyes. Not looking to see who has just come in the dojo door. Giving full, direct attention to a speaker. Giving full, direct attention to a task at hand. Concluding conversations completely before leaving. In this country, a gradual departure is a gentle way of signaling that a conversation is over. The Japanese have a handy and more direct technique for indicating the end of an encounter — a polite bow). In the "Three-Minute Ki Exercise for Health" (Appendix B) the most common error is in the direction of the eyes. The consequences of incorrect focus become quickly apparent if the exercise is done while walking. Failure to coordinate mind, body, eyes, and focus will leave the student dizzy and disoriented. In pairs, as nage extends Unbendable Arm. Uke tests as nage says: "No, no, no!" Observe the results. Uke tests as nage says: "Yes, yes, yes!" Observe the results. Many attempts at self-defense are essentially cries of "No, no!" and a pushing away — when the push is very fast and hard it is known as a punch or a kick. 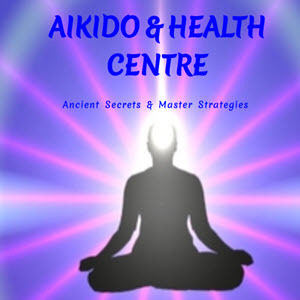 Aikido says "Yes! Yes!" and draws closer. Aikido techniques may fail if nage tries to hold uke at arm's length, at a "safe" distance. This appears safer, but is not. Step 2 of many a technique could be phrased as "Give uke a hug." This appears more dangerous, but is not. The perception of safety or danger is in the mind. And just as you can choose to be angry or not angry, you can choose to be afraid or not afraid. The danger (or lack of it) is the same, although attitude can often increase or decrease the danger. I once watched a man wandering through the street drunk or on drugs. Passersby observed him with a watchful calm that offered him no point of focus until one young woman panicked, "Get away from me!" she shrieked, and darted wildly about in confusion. Her noise, random motion, and terror made her everyone's focal point — and his. He set off in hot pursuit. She was grateful to be rescued but others did not need rescuing, due not to size, martial arts training, or weapons — but attitude. The attacker is amazingly dependent on the "victim."